Total area: 6,440 sq. kms. Thoothukudi, also calledTuticorin in English, is a port City in South India and a metropolitan city inTamilnadu. It had once been a beautiful peal – fishery town. There had beenconstant conflicts here between the Muslims and the fishermen from 1520s toroughly 1550s. In this struggle, the Portuguese came to help the fishermen. ASan expression of gratitude, during 1535-37, thousands of fisher folk embracedChristianity. To serve these newly converted Christians, both Ignatius ofLoyola and Pope Paul II sent St. Francis Xavier who landed in Thoothukudi in1542. The first groupconversion in the interior took place at Marichukatti, the presentAzhagapapuram near Kurumbur in 1550 by the efforts of the Jesuit Priest. As a result,the first Church ever to be erected in the interior was that of Marichukattidedicated to St. Michael, the Archangle (1571). Many more conversions tookplace in the other parts of the interior around the year 1600 particularly atSrivaikundam, Thirukalur, Kalakadu, Vadakangulam, Azhagapapuram, Anaikarai(Isalapuram), Kallikulam (Theraikulam) and in the vicinity of Sathankulam. TheChurch of St. James at Srivaikundam and that St. Mathew the Apostle atThirukalur were erected already in 1600. As Thirukalur was then the biggestChristian Village in the interior, naturally it became the first Parish in theinterior of the present Diocese of Tuticorin and Srivaikundam and othervillages were all attached to Thirukalur as its substations. The Misssion ofThoothukudi was first placed under the Goa Mission. Then in 1557 it wasattached to Cochin and in 1600 it became a separate Vicariate. In 1886 whenTiruchirappali became a separate Diocese, Thoothukudi formed a part of it.Separated from Tiruchirappali, Thoothukudi was created a Diocese in 1923 by theApostolic Brief “Quae Catholico Nomini”ofPope Pius XI. This new Diocese was entrusted to the indigenous Clergy with Rt.Rev. Francis Tiburtius Roche S.J. as its first Bishop who also the first IndianBishop of the Latin Rite. Bishop Thomas Fernandowas consecrated as the second Bishop of Tuticorin on 7th October1950. In January 1971, Bishop Thomas Fernando was transferred to the Diocese ofTiruchy. On 9th December 1971 Bishop M. Ambrose was consecrated asthe third Bishop and he also was transferred to the Diocese of Coimbatore. On 4thFebruary 1981 Bishop S.T. Amalnather was consecrated as the fourth Bishop ofTuticorin. After his retirement on 8th December 1999, Bishop PeterFernando who was consecrated as the co- adjutor on 29th May 1996took charge of the Diocese, as the fifth Bishop of Tuticorin. Then due to hispromotion as the Archbishop of Madurai on 22nd March 2003, the Seewas vacant for about two years during which period Archbishop Peter Ferenandoremained the Apostolic Administrator of the Diocese. On 18th May2005 Bishop Yvon Ambroise, the present Bishop, was consecrated as the sixthBishop of Tuticorin. 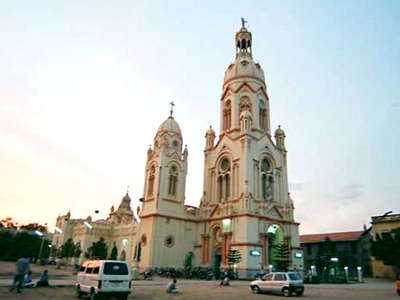 The present ThoothukudiDiocese comprises a major part of the newly created Thoothukudi district,nearly half of Thirunelveli district and a small portion of Kanyakumaridistrict. There are 116 parishes and one quasi parish (Meenavankulam) and about500,000 (2015) Catholic in this Diocese. The history of the Catholic Church in India is very extensive. It traces its origin in the preaching of the Apostle St. Thomas, who, according to tradition, came to India in 52 A.D.